1. RS485 and TCP/IP interfaces only support GeoVision readers, while Wiegand interface supports both GeoVision and 3rd party readers (Wiegand 26~64 Bits). GV-Reader 1251 GV-Reader 1251 is a card reader that uses a 125 kHz frequency. It has both Wiegand and RS-485 outputs that can be connected to any standard access control panel. GV-RK1352 GV-RK1352 is a card reader with keypad that uses a 13.56 MHz frequency. 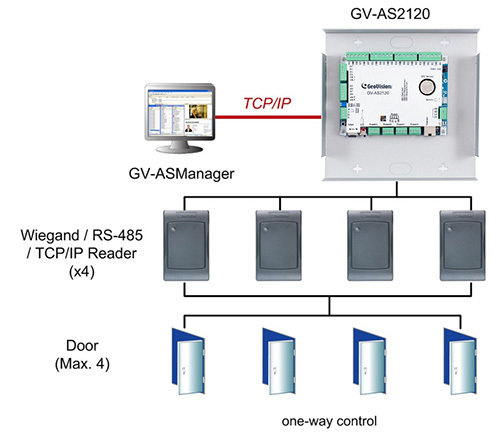 The reader has both Wiegand and RS-485 outputs that can be connected to any standard access control panel. GV-R1352 GV-R1352 is a card reader that uses a 13.56 MHz frequency. The reader has both Wiegand and RS-485 outputs that can be connected to any standard access control panel. GV-DFR1352 GV-DFR1352 is a card reader that uses a 13.56 MHz frequency. The reader has both Wiegand and RS-485 outputs that can be connected to any standard access control panel. GV-GF Fingerprint Reader The reader supports three operation modes: Fingerprint Only, Fingerprint + Card and Card Only. In Fingerprint Only mode, the fingerprints are enrolled through GV-ASManager. In Fingerprint + Card mode, the fingerprint templates are stored on the user card. In Card Only mode, the users only need to swipe the card to be granted access. Readers with optical and capacitance sensors are available. GV-CR420 GV-CR420 is a card reader with a built-in 4MP wide angle IP camera. The card reader recognizes identification cards and transmits live view through network connection. Push Button Switch The push button switch can be integrated with access control system, allowing door exit by momentarily activating or deactivating the electric locking device. Both American standard and European standard push buttons are available. GV-IB25 / 65 / 85 Infrared Button The GV-IB25 / 65 / 85 Infrared Button detects infrared movement within 3 to 12 cm and allows you to open the door with a wave of hand. Electric Lock Three types of electric locks are available: electromagnetic lock, electric bolt and electric strike. GV-POE Switch The GV-POE Switch is designed to provide power along with network connection for IP devices. The GV-POE Switch is available in various models with different numbers and types of ports. 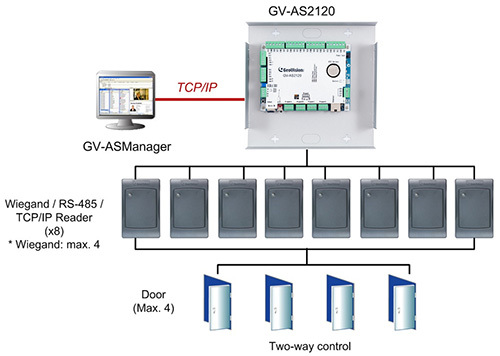 GV-AS2120 requires PoE that provides at least 25.5 W (IEEE 802.3at). GV-EV48 è un controller elevatore pensato per controllare l’accesso di 1 ascensore con un massimo di 48 piani. Fino a 2 GV-lettori / lettori di impronte digitali GV-GF possono essere collegati a GV-EV48 utilizzando RS-485 e la connessione di rete.